Students wave an Estelada (Catalan separatist flag) during a gathering to protest against the imprisonment of leaders of two of the largest Catalan separatist organizations, Catalan National Assembly's Jordi Sanchez and Omnium's Jordi Cuixart, who were jailed by Spain's High Court, in Barcelona, Spain, October 17, 2017. 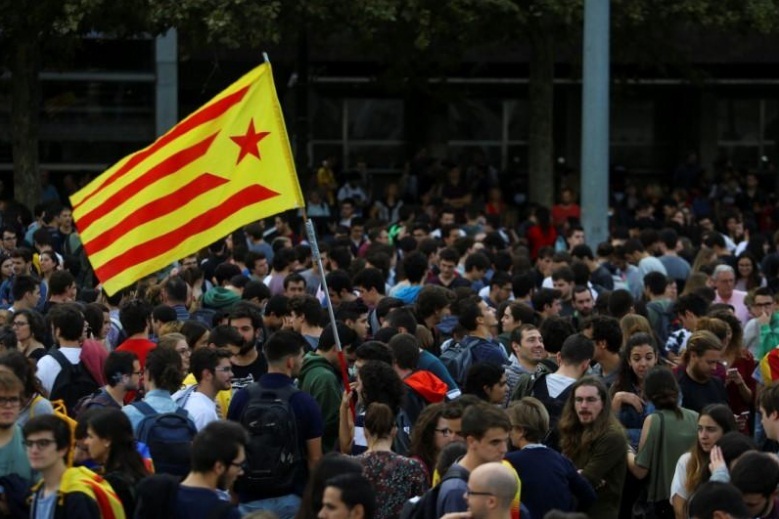 MADRID/BARCELONA - Catalonia refused on Tuesday to bow to the Spanish government’s demand that it renounce a symbolic declaration of independence, setting it on a political collision course with Madrid later this week. The Spanish government has threatened to put Catalonia, which accounts for a fifth of the economy, under direct central rule if its government does not abandon independence by Thursday. But Catalonia’s government rejected Prime Minister Mariano Rajoy’s deadline. Spain’s biggest political crisis in decades worsened on Monday night when Madrid’s High Court jailed the heads of Catalonia’s two main separatist groups pending an investigation for alleged sedition. The Catalan government accused Madrid of taking “political prisoners” and one of the groups has called for peaceful demonstrations around Catalonia on Tuesday, with the biggest expected to begin in Barcelona in the evening. The phrase was an allusion to the military dictatorship under Francisco Franco, when Catalan culture and language were systematically suppressed. It carries an emotional resonance given fascism is still a living memory for many Spaniards. Justice Minister Rafael Catala hit back saying the jailing of the leaders of the Catalan National Assembly and Omnium was a judicial, not a political, decision. The crisis has deepened divisions at the heart of Spain’s young democracy, underlining the complex sense of nationhood in the euro zone’s fourth largest economy. In Madrid, unionists drape their homes in the national flag, while Barcelona apartment buildings are festooned with Catalan flags. Street protests of hundreds of thousands of people have been held on both sides of the divide, including in Catalonia. “They’ve crossed a line,” said Eulalia López, a 54-year-old office worker in Barcelona. She said she and her colleagues would come out onto the streets if Madrid went ahead and took control of the region. European capitals and financial markets have looked on with mounting alarm since Oct. 1, when Catalan authorities held a referendum on independence in defiance of a Spanish court ban. ANC leader Jordi Sanchez and Omnium chief s Jordi Cuixart are accused by prosecutors of helping to orchestrate pro-independence protests that last month trapped national police inside a Barcelona building and destroyed their vehicles. That same incident also led to Catalonia’s police chief, Josep Lluis Trapero, being investigated for sedition. He is accused of failing to order his force to rescue them from the building. He has not been detained but the High Court banned him from leaving Spain and seized his passport. Spanish police launched a violent crackdown in an effort to thwart it, using rubber bullets and batons on voters in scenes that shocked Spain’s European neighbors. Catalan officials say 43 percent of voters still managed to cast ballots with 90 percent in favor of breaking away. Many unionists, however, obeyed Madrid and did not vote. One of Catalonia’s major foreign investors, Volkswagen, said on Tuesday that its Spanish division, Seat, had decided to delay announcing the name of its forthcoming model. Seat, based in Martorell in Catalonia, had planned to announce the name of its 2018 sport-utility vehicle this month, about a year ahead of the 7-seat model’s launch. “With the entire Spanish media focused on politics at the moment, we have decided to find a better time,” a Seat spokesman said, adding the division had also delayed the announcement of an innovation and digitization agreement. He did not elaborate. Catalonia refused on Tuesday to bow to the Spanish government’s demand that it renounce a symbolic declaration of independence, setting it on a political collision course with Madrid later this week.